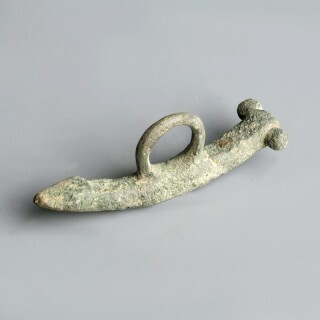 An Ancient Roman patinated bronze amulet in the form of a realistically modelled phallus with integral suspension loop. 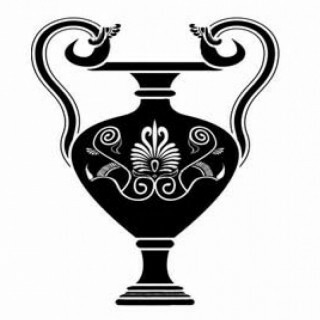 Phallic emblems are found on a wide range of Roman objects, from amulets to frescoes, from mosaics to lamps. Such pendants were a symbol of fertility, as well as performing an apotropaic function.The phallic deity was called Fascinus, from the Latin word ‘fascinare’, meaning “to cast a spell”. Charms and amulets shaped as phalluses were worn to invoke the god’s protection against evil spells, and were a common piece of jewellery in ancient Rome. According to Pliny the Elder, charms of this kind were worn even by babies and soldiers. Fine condition; a few light accretions.